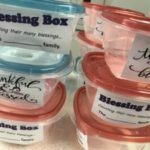 Pick up a Blessing Box for your family on Sunday! This box can be placed in your home and you will find the joy of celebrating blessings as you place coins in it every time you recognize a blessing in your life, your home, your workplace, at school or with friends! Fill it up and bring it back on May 13! What Is A DISCIPLE WOMAN? Amazing! Fun! Active! Creative! Just a few of the ways we describe our Disciple Women! Our Disciple Women group is open to all women of the church and is one of our most active groups in the church. From hosting dinners to monthly meetings and fun outings to Lyric Theatre the Women are a thriving part of FCC. The group holds monthly meetings at 9:30 a.m. on Wednesdays from September-May. At the meetings, women enjoy a time of fellowship, a study presentation and updates on all the activities going on with the group. The Disciple Women believe strongly in service above self. As a result they give monthly donations to various projects including: Blanket Sunday, Guthrie Upper Elementary School for Teacher Supplies, Heifer Project, Local Food Banks, Central Christian Camp and other projects as determined by the group. The Disciple Women are a big part of the “Behind the Scenes” crew that help with meals at the church. One of their major contributions is hosting Bereavement Dinners for families who have recently lost loved ones. Judy Coburn and Pat Ball lead a dedicated team of more than 25 women who respond on a moment’s notice to the need for meals for families ranging in size from a dozen people to 150. There is always plenty going on with the Disciple Women. For more information, contact our leadership team of Jane Weeks, Margaret Hixon, June Patrick and Judy Coburn, or staff member Karen Allen. Also check out the event’s calendar to see what’s happening in Disciple Women. Guide us that we may truly serve you.